One of Dallas’ most highly-anticipated luxury residential and retail towers has unveiled its latest designs. The designs showcase the inside and outside of the 20-story residential and retail tower, known as One Dallas, on the former Hard Rock site at the northeast corner of McKinney Avenue and Routh Street. At completion, the luxury tower will be one of the tallest and most-high profile developments in the neighborhood. “Everything is really looking up,” Stoneleigh President Rick Cavenaugh said. The tower will include 30,000 square feet of retail in two restaurant spaces. Style & Grace is the first named restaurant of the project. Cavenaugh declined to disclose the name of the second restaurant, saying a lease has yet to be finalized. By mid-August, Cavenaugh says he expects to start work on digging out the underground parking garage for the property. The tower is expected to be complete by mid-2016. Developers broke ground this morning on a 20-story Uptown apartment tower. 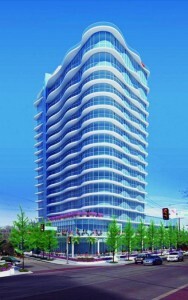 The One Dallas building is being constructed at the corner of McKinney Avenue and Routh Street. It’s on the former site of the Hard Rock Café. Dallas investor and developer Paul Cheng and Stoneleigh Cos. of Illinois are building the project, which will have 198 luxury apartments and 18,000 square feet of retail. There’s also going to be a rooftop pool and restaurants on the groundfloor. “Uptown has limited vacant developable land, so when we bought the land in 2013, we conceived One Dallas, a contemporary multi-family residential and retail tower with a unique design, premium retail and public space in the heart of Uptown Dallas,” Rick Cavenaugh, President of Stoneleigh, said in a statement. Phil Shepard and Humphreys & Partners designed the building. And Hunt Construction Group is the general contractor. Bank of America provided construction financing and iStar Financial Group Inc. is the institutional equity partner. It took a bit longer than anticipated, but Illinois-based Stoneleigh Companies LLC, along with Dallas-based Cheng Investments, are getting ready to shovel dirt at the longtime vacant former Hard Rock site. The 20-story luxury residential and retail tower will be one of the tallest, and most high-profile developments, in the Uptown neighborhood. The out-of-state development group recently hired Dallas-based Hunt Construction Group to build the project at the northeast corner of McKinney Avenue and Routh Street. The group plans to start by digging a hole twice as deep as the hole Gables Residential dug to build an underground parking garage below the soon-to-be Whole Foods anchored development on the kitty-corner site to the Hard Rock tract. Cavenaugh plans to hold a groundbreaking ceremony at 9 a.m. on Wednesday, July 23. Last time I spoke with Cavenaugh, he was in the process of finalizing the retail tenants for the tower, which includes about 30,000 square feet of retail and restaurant space. The project also includes 200 luxury apartments homes. Waterford Residential was hired to be the management company for the tower, with apartments being leased for $2.25 to $2.50 per square foot. Phil Shepherd is the project architect. Humphreys & Associates is also working on the project. The project is expected to be complete by spring 2016. Construction is set to begin next week on an Uptown Dallas apartment tower. Dallas’ Cheng Investments and Stoneleigh Cos. are building the 20-story residential high-rise on the former site of the Hard Rock Cafe on McKinney Avenue at Routh Street. Called One Dallas, the building will contain about 200 apartments plus extensive retail on the first two floors. Development partner Paul Cheng said the groundbreaking will be on July 23. “It will feature six levels of underground parking, charging stations for electric vehicles, rooftop pool and interior lobby designed by designer Francois Frossard,” Cheng said. Dallas architect Phillip Shepherd designed the building along with Humphreys & Partners Architects. Real estate brokers say the developers have talked to several high-end local eateries about moving into the project, including The Palm, which is now in downtown’s West End. Cheng Investments is building the tower in partnership with Illinois-based Stoneleigh, which is headed by Rick Cavenaugh. The two firms bought the McKinney Avenue tract almost a year ago. The popular Hard Rock Cafe building — a historic church — was knocked down in 2008, right before the recession hit. Since then the land has been idle. Hard Rock Cafe now operates in the Victory Park development on the north edge of downtown Dallas. The One Dallas tower will be constructed across the street from where Gables Residential is building a Whole Foods Market with apartments above the grocery store.